More and more Talk N Text subscribers are finding ways to save in promo registration, but most blogs share non working promos, so I checked the official Talk N Text website and Talk N Text FB page and collected all working TNT text and unlimited text promos, why working? Because it is still posted on their website and a representative of Talk N Text confirmed this, as well as I've tried this promo myself. While the promos of Talk N Text, text only promos are vast, I will share only a few but most use and the best text promos so far. The promos will range from P10 to P300 and 1 day to 30 days unlimited text. With text to all networks and text to SMART, SUN, and TNT subscribers. *UA20 send to 4545 (UNLITXT 2ALL 20)- Unlimited text to all networks, which is valid for 2 days. The price is P20.00 only. *UA300 send to 4545 (UNLITXT 2ALL 300)- 30 days unlimited text to all networks for Php300. *GT10 to 8855 (GAAN TXT 10)- 100 SMS/MMS to SMART or TNT, with 10 free text to all networks for only Php10 that is good for 1 day. GT20 to 4545 (GAAN TXT 20)- 200 text to all networks which is valid for 2 days, for 20 pesos. *U10 send to 4545 (UNLI TXT 10) - Unlimited text to SMART or Talk N Text subscribers that is good for 1 day for only P10. 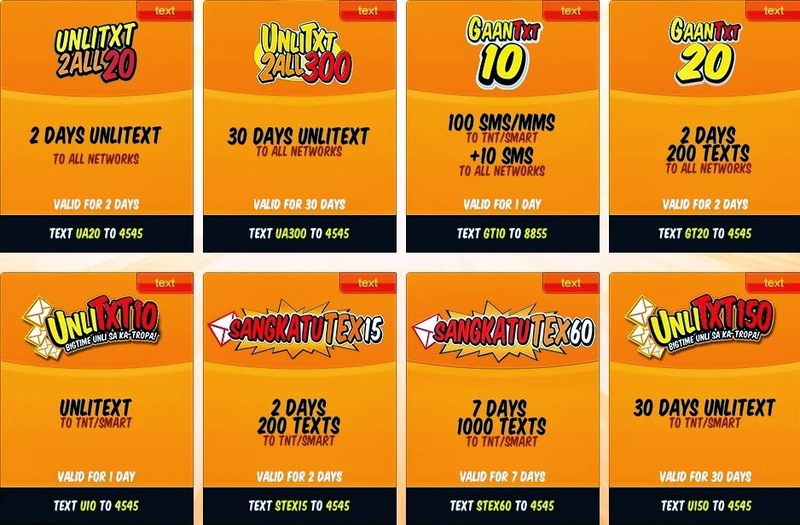 STEX60 to 4545 (SANGKATUTEX 60) - 7 days texting with 1000 texts to TNT/SMART for 60 pesos only. *U150 to 4545 (UNLITXT 150) 30 days unlimited text to Talk N Text and SMART for only P150.00 only. Note: Promos marked with (*) are the recommended promos. I will add more text promos here if Talk N Text will release new text promos. For call promos, for call and text combo promo. Salamat sa pagbisita sa TNT blog Ka-Tropa. still working pb ang one month unli? @loneheart010: Have you tried the one-month unli to all network? I really love smart kasi yung promos nila lagi may kasamang free sms philippines.